Click the button below to unlock this. Male patient *1938, by Büchi and Jung (2010-2012). This patient came to our office because he was bothered by the low esthetics and masticatory performance of his dental works. Objectives: Reconstructive periodontal therapy aims to re-establish the architecture and function of periodontal supporting structures lost in periodontitis. Previous studies have reported the potential of guided tissue regeneration (GTR) to regenerate periodontal ligament, cementum and alveolar bone. This case report clinically and tomographically evaluates the treatment of a mandibular class II furcation defect using a collagen membrane associated with anorganic bovine bone plus porcine collagen. 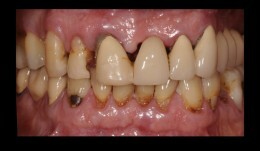 Methods: A female non-smoking patient aged 47 years required periodontal treatment. At clinical evaluation, tooth #46 presented a mandibular class II buccal furcation defect. Clinical parameters were probing depth (PD), clinical attachment level (CAL), vertical furcation depth (VFD) and horizontal furcation depth (HFD), and tomographic parameters were tomographic horizontal depth (THD) and tomographic vertical depth (TVD). These were recorded at baseline and one year after surgery. Six weeks after the last session of SRP, a GTR procedure was conducted on tooth #46. Following local anesthesia, intrasulcular and vertical releasing incisions were made and mucoperiosteal flaps were reflected. The inner aspect of the flaps was curetted, the osseous defects were debrided, and thorough scaling and root planing (SRP) were performed using Gracey periodontal curettes and ultrasonic scalers. After irrigation with physiologic saline solution, the collagen membrane (Bio-Gide Perio) was trimmed to cover the osseous defect and extended 3mm apically and laterally to the adjacent bone, and the defect completely filled with anorganic bovine bone and porcine collagen (Bio-Oss Collagen). The membrane was positioned and sutured with resorbable sutures. The flap was positioned coronally until it completely covered the membrane, before applying Nylon sutures. Amoxicillin 500 mg, clavulanic acid 125 mg, nimesulide 100 mg and PerioGard rinse were prescribed. Results: Nylon sutures were removed 14 days after surgery. During the one-year healing period, the patient was maintained on a weekly plaque-control programme for the first month, two-weekly for the second and third months, and monthly thereafter. Healing was uneventful, with no membrane exposure or other complications. The changes in clinical parameters from baseline were: PD reduction 2mm (from 3 to 1mm), CAL gain 2mm (from 3mm to 1mm), VFD reduction 3mm (from 4mm to 1mm) and HFD reduction 2mm (from 3mm to 1mm). Tomographic measurements obtained through sagittal and coronal sections cone-beam CT, showed reductions in THD from 2. 3mm to 1mm and in TVD from 3. 2mm to 1. 4mm. The clinical percentages of defect fill were 75.0% for VFD and 66.66% for HFD; the tomographic percentages of defect fill were 56.52% for THD and 56.25% for TVD. 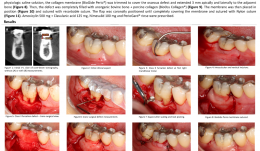 Conclusion: The association of Bio-Gide Perio and Bio-Oss Collagen was associated with uneventful healing and significant good results in the treatment of a mandibular class II buccal furcation defect. GTR promoted improvement in both clinical and tomographic parameters, and defect fill of more than 50%. Dental Campus can not take responsibilities for any failures.